On Sunday, Josh Freeman saved the Buccaneers 5 points when he kicked the ball out of the end zone after a snap sailed passed his head while he wasn’t looking. Fans on Twitter were calling him and his center Jeremy Zuttah every name in the book, yet they should actually hear the whole story. During that play, Freeman was looking over at Mike Williams who was supposed to be going into motion, he signaled to Williams to shorten the motion because the play clock was getting close. Guard Davin Joseph, seeing that Freeman was audibling to Williams, wanted to let center Jeremy Zuttah that Josh was changing the play, so he tapped him on the leg. The silent count plan was for guard Gabe Carimi to tap Zuttah on the leg to snap the ball. Joseph’s tap confused Zuttah and he snapped the ball before Freeman was ready. Freeman explained this on a live broadcast on 620 WDAE, he also explained that kicking the ball out of the end zone was something that they were trained to do, to prevent a touchdown by the opposing team. He actually used his head and did his job. I think the negativity in the media against Freeman has poisoned the players opinion of their leader. Freeman is their leader, whether they are on board or not. But when you look at how Freeman is leading his team, he does his job. I can’t say that all of the teammates are doing their jobs, especially on the offense. During the preseason, it almost looked like the offensive line were allowing sacks. If your teammates are not there to protect you in preseason, then something is not right. In my opinion, the players should vote again, and this time include their quarterback to the team captains, because of the respect that it shows for their leader. 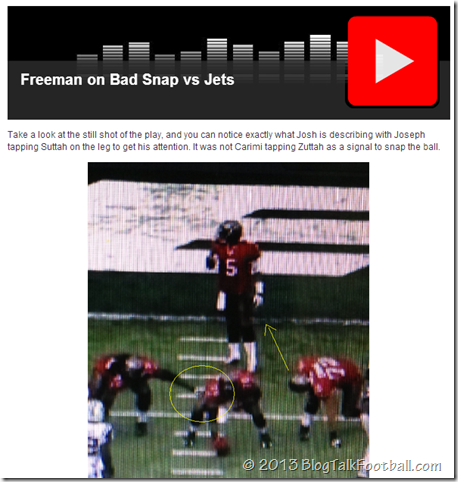 It is not like Josh Freeman is that outspoken on the team. In fact, I think he is a little too quiet… in situations where plays are messed up, he needs to be going over the play with the player and explaining what he needs his teammate to be doing. A leader will not only be the cheerleader, but also the coach. Josh, go ahead and take back the captaincy! If you believe you are the quarterback of a leading team in the NFC South, you owe it to your team to get in front of the players and tell them.